This paper focuses on the use of energy information hardware and software to provide sub-metering in commercial buildings and identifies some of the tools available to the contractor or owner wishing to provide these services to customers. Owners and managers of commercial and institutional properties are increasingly challenged to maintain profit margins in the face of high vacancy rates and more competition for tenants. This competitive pressure, combined with volatility in energy rates and the specter of deregulation in the electric industry has resulted in a rapidly growing demand for more timely and accurate energy information. Historically, getting this type of information has been expensive and the installation of energy information systems has been left to specialists such as systems integrators or building automation contractors. 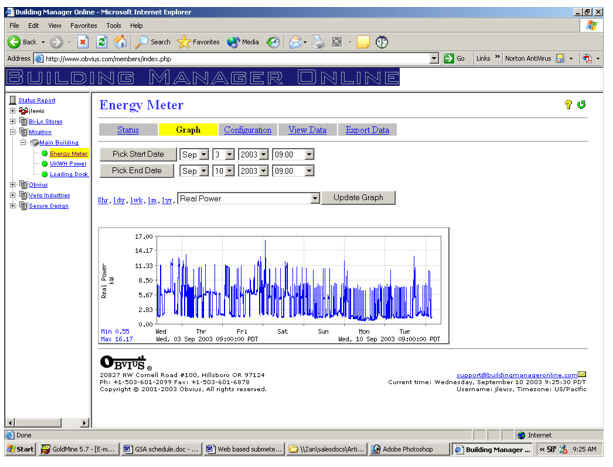 In response to the growing demand in this market, manufacturers of metering products have introduced new metering and data collection products that allow any electrical contractor or building owner to provide Web-based energy information to customers and tenants cost-effectively. The use of sub-meters provides the manager with the tools to allocate costs fairly and insure that tenants with high energy usage are not subsidized by other tenants with lower energy densities. 3. Software (either local or on a remote web site) to access the information and produce graphs, tables, etc. The growth in demand for sub-metering has produced a number of companies that are building specialized hardware and software designed specifically for the sub-metering market, including split-core power meters such as those shown in Figure 1 below. 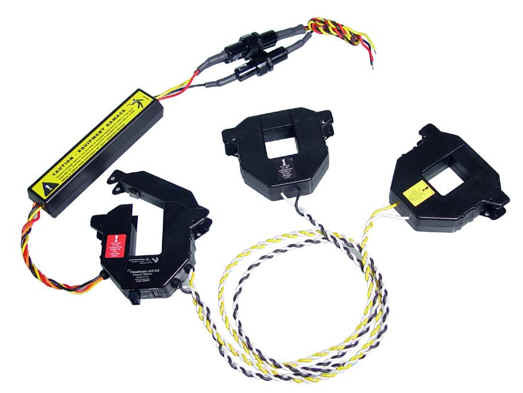 These meters allow installation in just minutes, without the need for removing and reconnecting power feed lines. The meters are available from several different manufacturers and are capable of providing not only energy (kW, kWH) information, but also some limited power quality data (e.g., power factor). Typically, the output of the meters uses a Modbus RTU protocol communicating over an RS485 serial loop. These meters typically cost between $300 and $800, depending on the service size (amps) and the variety of data to be collected, and usually take less than 15 minutes to install. 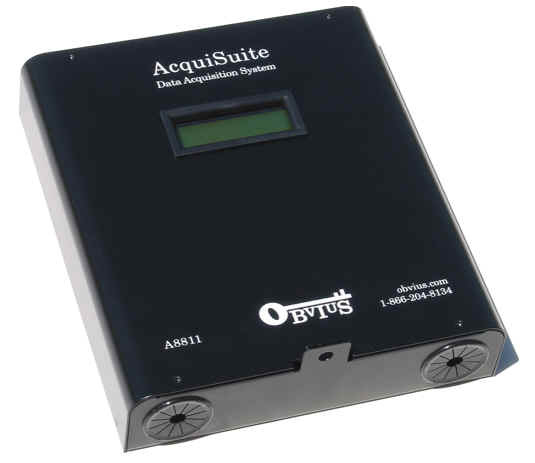 The meters connect to a data acquisition server (DAS) such as the one shown in Figure 2, which polls the meter(s) on selected intervals (typically 15 minutes) and stores the data in non-volatile memory. The DAS then uses a phone line or LAN connection to report the data to a local or remote database server, typically on a daily basis. The latest generation of DAS (such as the one shown here), provide "do-it-yourself" ease of installation, as the DAS is designed to automatically recognize and configure the meters as they are connected, minimizing the time and cost required to set up the system. The cost for the DAS (capable of connecting to 63 meters) is generally less than $1,000 and the device can be installed and configured in less than an hour using only a laptop with a Web browser. The last piece of the puzzle is the software that allows the user to see information in a useful manner. The easiest and most cost effective approach is to use a Web site that gathers data from DAS's at a variety of locations and allows users to log in and view data using any Web browser (e.g., Microsoft Internet Explorer). The user can access information from any location without the need for additional software, which provides the ability to see data from one or many remote buildings from any computer with Internet access. Log in is done with a user name and password, providing the building owner with security of the information and allowing the owner to determine what information is available to different users. The monthly cost for this service is generally around $20 per month for each DAS, regardless of how many meters are connected. A typical report is shown below. What if there are other meters installed? The ability of the DAS to support different meters varies depending on the manufacturer, but the DAS from one company provides "plug and play" support for meters from Power Measurement, Square D, Veris, Siemens and E-Mon. This DAS also supports pulse inputs from any electrical meter with pulse outputs as well as pulse inputs for gas, water and steam. What training is required? If the DAS selected is designed for automatic configuration of supported meters, there is virtually no need for any training or specialized software tools. The DAS provides forms for setup that can be used with any Web browser, allowing the contractor to install and setup the DAS in just minutes. Can additional sub-meters be added later? The typical DAS supports up to 63 meters and new meters can be added at any time. The DAS will recognize the new meter and automatically begin measuring interval data with the meters already installed. How does the DAS communicate? The DAS uses the Internet to provide the connection between the local site and the site where the software is located. 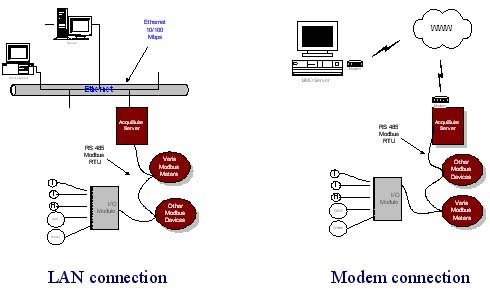 The connection can be either a dial-up connection using the modem in the DAS, or via an existing LAN connection. What do customers see on the web site? 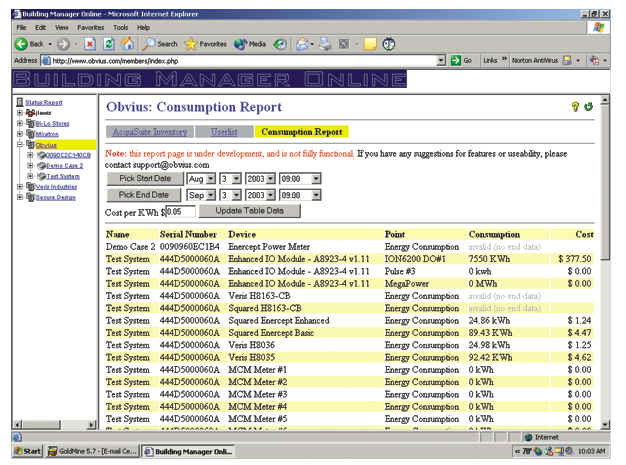 Once the data is communicated to the web site, the building owner or manager can access the information for any or all of the connected meters and see time stamped interval data (see Figure 5) or can request standard or customized reports like the cost allocation report in Figure 3 (above). This information can then be used to generate cost allocation bills for customers, to verify operations of mechanical equipment, or to spot opportunities for further improvements in energy efficiency. Summary - Advances in hardware and software, combined with the tools available for Internet-based communications are opening new opportunities for building owners and contractors to provide sophisticated, Web-based energy information for new and existing customers. The best news is that these services can be provided without a significant investment in training and software or the need to hire systems integrators to install and configure these systems for commercial customers. Jim Lewis is the co-founder and CEO of Obvius, based in Hillsboro, OR. He was the founder and President of Veris Industries, a supplier of current and power sensing products to BAS manufacturers and building owners. Prior to founding Veris, Mr. Lewis spent 10 years in the Homes and Buildings Group of Honeywell. He has extensive experience in knowing the needs of building owners, integrating existing metering and sensing technologies and developing innovative products for dynamic markets. Mr. Lewis holds a BS in Business from the University of Colorado and an MBA from the University of Oregon.